We hear you. And not only that, but we truly listen to you. The Setapp team knows that great software starts with an intuitive and attractive interface that can easily guide users through all the useful tools and functionalities. What's more, we're also aware that the lighting-speed with which trends and design advance nowadays allows for frequent updates that can improve the user interface. That's why we took all your suggestions, leveraged the latest advancements in UI design and implemented a few product changes tailored to your needs. 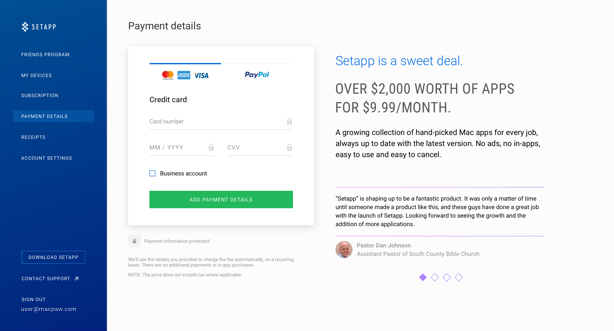 Welcome to Setapp's elevated user experience. What's New In Setapp's User Cabinet? 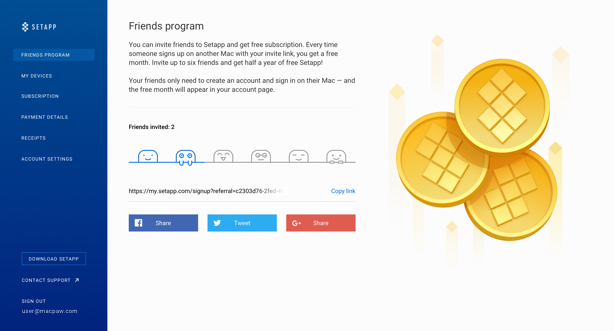 A fresh menu, spread on separate pages, for better account management. The interface now supports more functionalities for 4 categories and makes it easier for you to access exactly what you need, when you need it. We drew our UI inspiration from your valuable feedback to redesign the menu in a way that will help you have a better experience and manage it in just clicks. In Account Settings you will find all the tools to keep your profile secure and updated at all times. The new Subscription Management category will help you, in just a few clicks, to manage your subscriptions in a transparent and fast way. When it comes to device management, you will soon be able to add or remove devices to your account by visiting the designated section. And in the nearest time we'll launch more functionalities under the Payment Details Management section. By accessing it you'll be able to visualize your payment history and even download invoices to have a better grip on your budget. This UI redesign elegantly transforms your account management process in a simple and intuitive experience, just the way you wanted to. We're so excited by this change and we're eager to hear your thoughts on it. So follow your enthusiasm for the new and try our fresh version of Setapp. Give it a spin and have fun sliding through your account management like a breeze. Check out the new Setapp version to test the elevated ui experience and keep sending us your feedback. Here at Setapp, our mission is to deliver to your highest expectations, all the time, every time, by listening to your needs and wants.